When Catherine finishes school, she wants to help people like her with disabilities. When Catherine came to Nyaburi Integrated School, she couldn’t read or write. Unable to use her legs and hands, she came to school when a “good Samaritan” saw her and brought her to the school for disabled children. You can watch more about her story by clicking the video below. 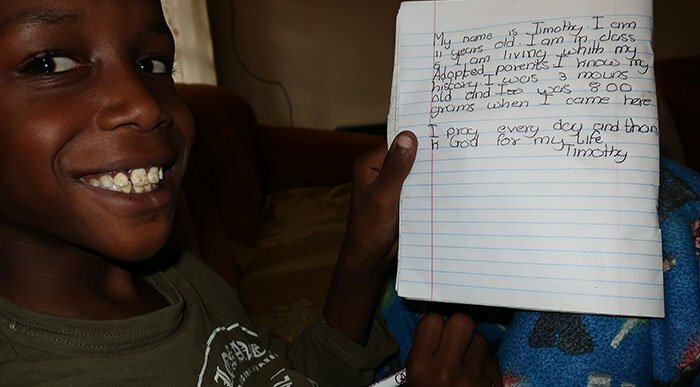 Today’s much-needed inspiration came from 11-year-old Timothy. 10 years ago, when Ray Loxdale and I were working in the Displaced Persons Camp, we met Timothy when he was just 3 months old. I have been following his progress since then. Today I visited him in his adopted parent’s home who also look after 12 other orphaned children. Timothy was doing an assignment for class. Here it is in case you cannot read it in the picture. He wishes to share his story. We met Janet when she was just 9 years old. She has come through incredibly difficult circumstances, and now owns her second shop in Kenya. You can hear more of Janet’s story by clicking the video below. Jefferson currently attends Ndanai Primary School. He’s an incredible guy. Without the use of his hands, he has overcome many obstacles and has high ambitions and goals for his life. You can watch more about Jefferson by clicking the video below.